Wilton Grill | Restaurants of the World Unite! Every Turkish restaurant I’ve been into has persisted in missing the open goal by not offering turkey on the menu. I would order Turkey Turkey. I would go with 3 friends and force them to order Turkey Turkey too. Waiter: So that’s four Turkey Turkeys then. Waiter: Great. I’ll get your drinks. Waiter turns on his heel to put the order in. Charlie Del Monte (Icily smiling): Confirm our orders individually. Waiter half turns back: What? Charlie Del Monte (Locking eyes with the waiter): You heard me. Waiter: You want me to confirm the 4 orders of Turkey Turkey that I’ve already confirmed. Charlie Del Monte (Outfoxing his prey): You got it. Waiter: I’m not going to do that. Waiter turns to leave. Friends #1, #2 and #3 shift uncomfortably in their seats. The waiter has crossed a line. Charlie Del Monte (Nonchalantly to his friends): I see someone doesn’t like tips. The waiter stops dead in his tracks. Slowly he turns back to the table only to see Charlie Del Monte’s unflinching, steel blue eyes staring right back at him, mere inches above the world’s most resolute beard. The waiter knows he’s been checkmated, but licks his teeth in defiance. A deep breath, and he begins, looking at each diner. Waiter: Turkey Turkey, Turkey Turkey, Turkey Turkey, Turkey Turkey. Charlie Del Monte: Actually I’ll have a doner. Admittedly this would get tiresome for my friends, but I’d go with different ones each time. 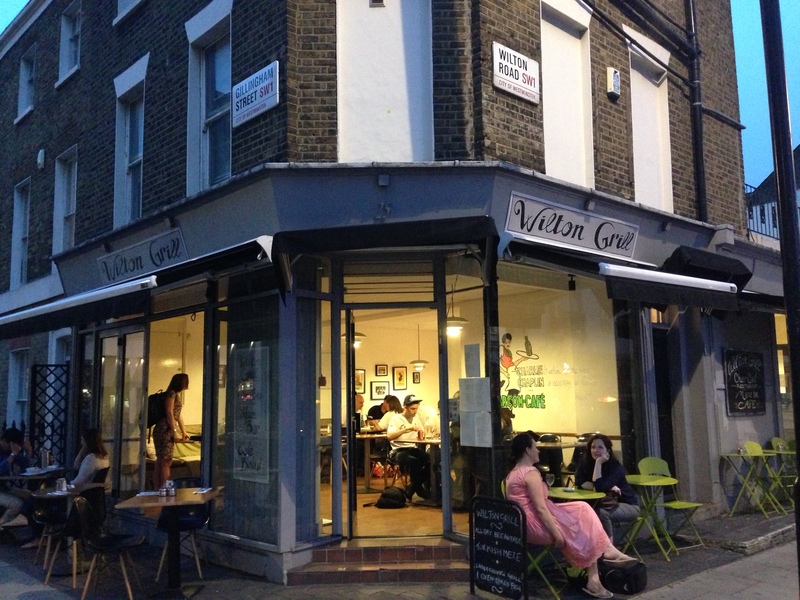 The Wilton Grill (beautiful language isn’t it) is in a prime location between Victoria and Pimlico and is well appointed offering shaded seating outside or within. 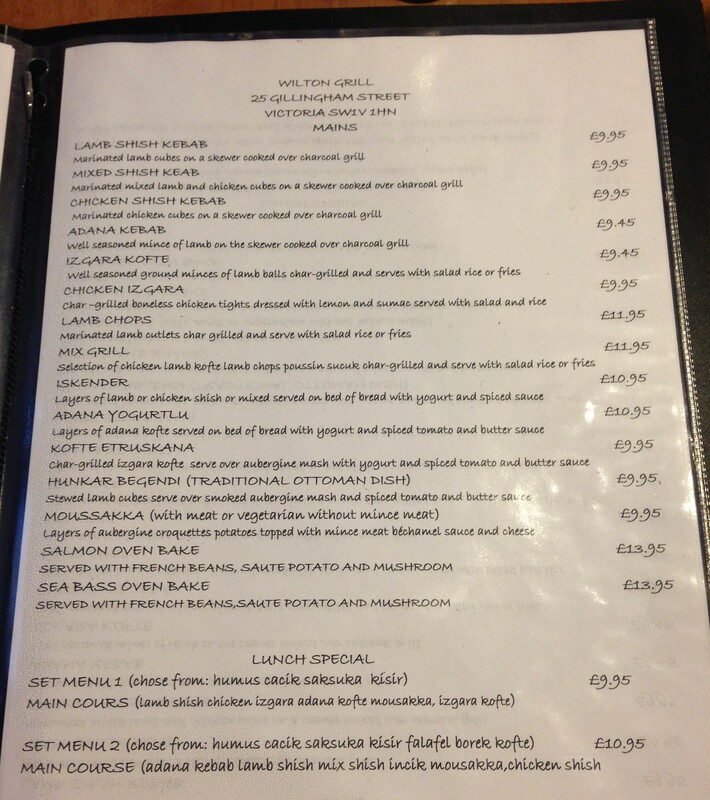 It has an extensive anglo-menu (full English Breakfast etc) but an equally large Turkish menu on offer and so me, Hanımefendi, Horse and Filly popped in and had to examine the menu in detail for there was so much tasty looking fare on offer. Chicken Tights aside – though Hanımefendi couldn’t resist. 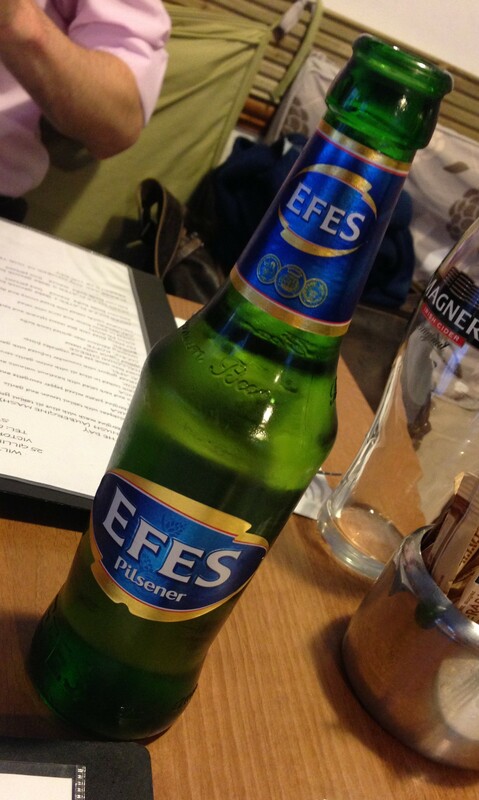 The Kofte Etruskana was succulent and on a bed of aubergine so tangy I gulped down my tall, cool Efes beer. The Mixed Mezze dish looked to be the gold standard. Exquisitely presented, it had something of everything (go figure) and inspired jealousy and bad feeling amongst those who didn’t order it. The food and service were terrific and I’ll be going back. I’ve also been to Tas (http://www.tasrestaurants.co.uk/) on The Cut which I enjoyed but can’t remember. I once travelled to Ankara for a few days and found the place massively dull, but it’s one of the few times that I’ve found the cuisine to be virtually identical to the highstreet version found in the UK. 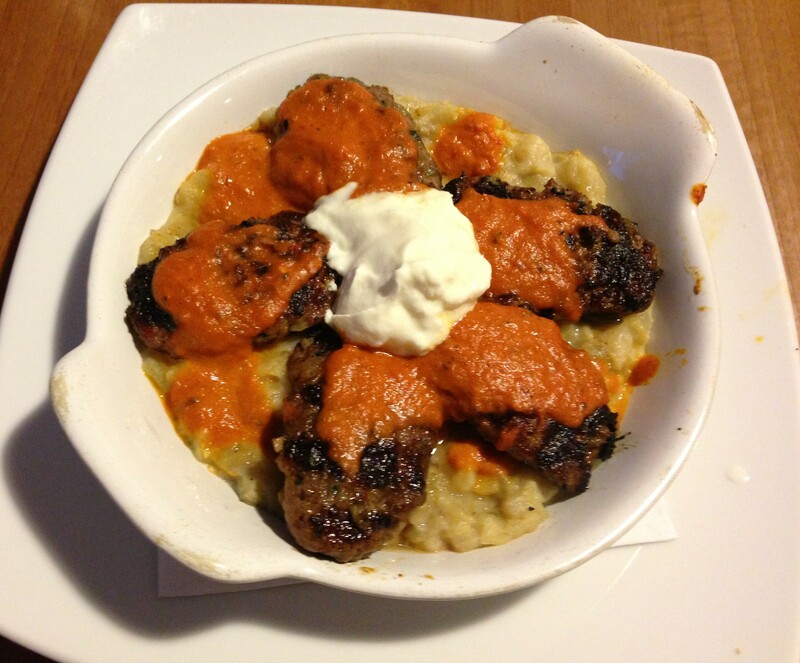 Kofte Etruskana. Don’t judge it by my inept photography – this was a delicious dish. 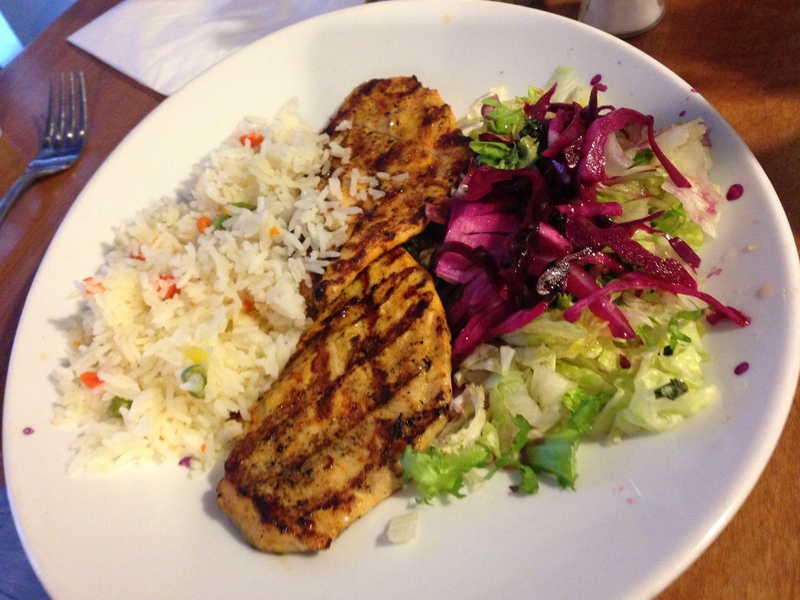 Chicken Izgara. The menu describes this as “boneless chicken tights”, which is a slur I endured frequently at school. 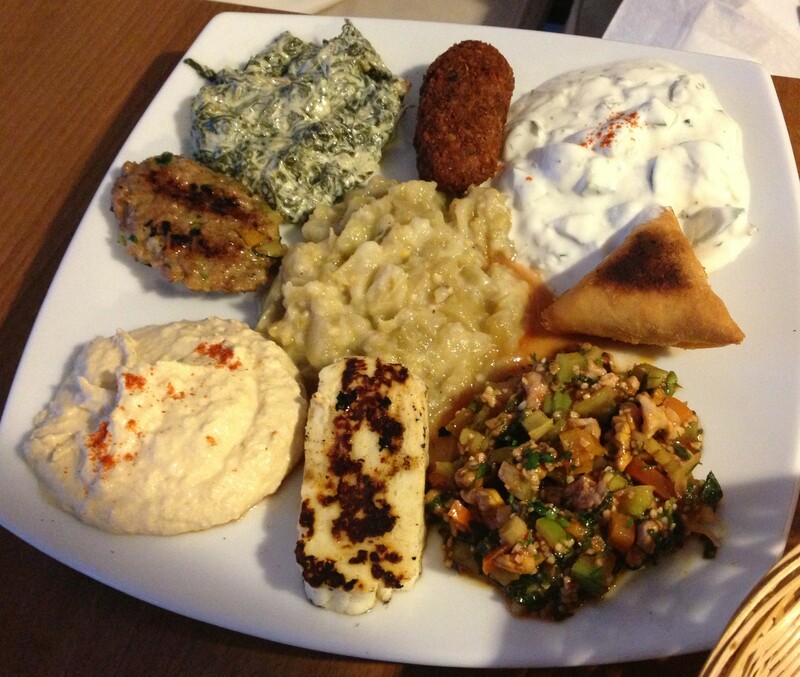 Didn’t I say about the Mixed Meze? What fools we were to not order this. A little corner of Turkey right in the middle of Victoria. It’s my understanding that downtown Turkey looks a lot like London. 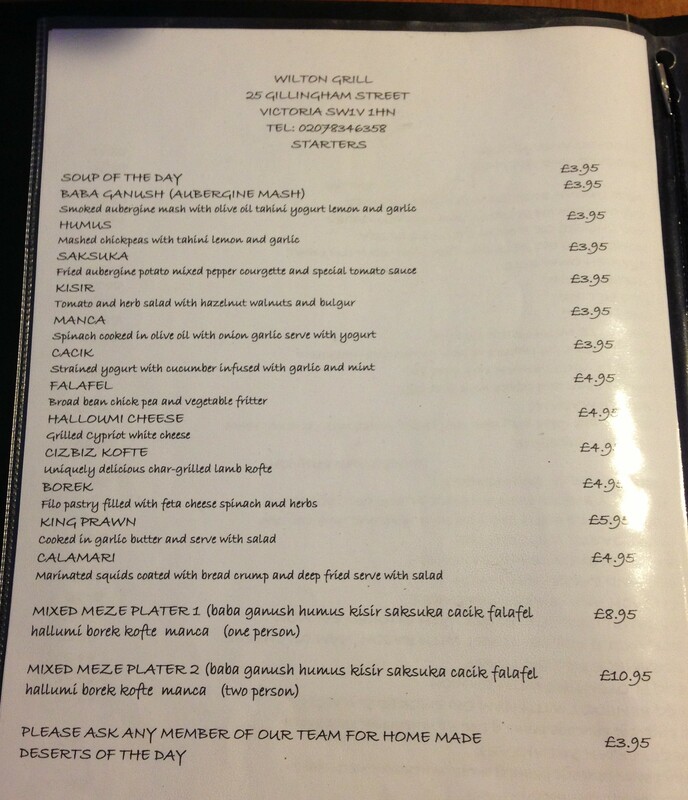 Hey Wilton Grill – what’s your problem with commas? Zing! Didn’t believe me about the tights? This place has changed ownership and it’s no longer up to the same standard. The baba ganush was virtually flavourless. Shame.